A humble vegetable, but a very important one – almost every meal begins with the peeling of an onion. They make a brilliant base for all sorts of dishes, from soups, stews and stocks to pasta sauces, stir-fries and curries. Ours are pretty pokey, so have some tissues to hand! 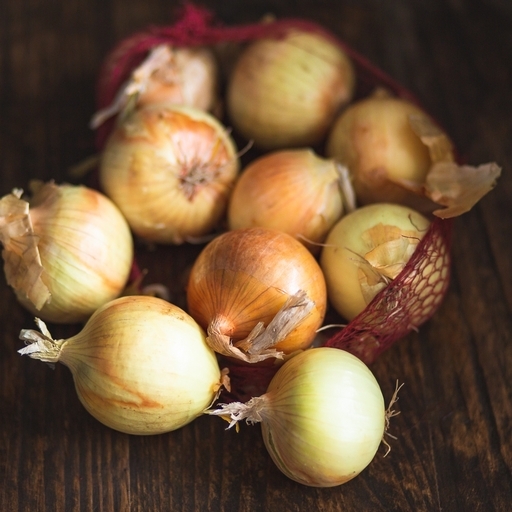 Onions are the foundation of so many dishes – but they can also be the centrepiece. Peel off the outer skin, cut a cross right to the root, stuff with thyme and a peeled garlic clove. Drizzle with oil and balsamic and roast at 200°C/ Gas 6 for about 45 mins, until tender. Or finely slice and sweat with a little olive oil for 45 mins, until soft. Then spread thickly on a sheet of shortcrust pastry with a scattering of anchovies and olives before baking for 20 mins for pissaladière (a bit like pizza). Keep cool and dry, preferably somewhere with a bit of air movement. The season begins with fresh, green onions with their tops on from May. Dry white and red onions are around from July to February. We’ve tried to grow onions on our farm in Devon, but it’s far too rainy! Instead, we make use of the drier climate at Riverford on Sacrewell Farm in Cambridgeshire. Nigel’s crop does well on the naturally fertile silty clay loam soil on the farm.